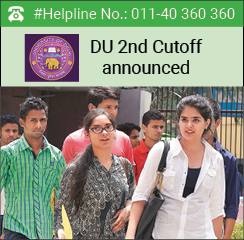 DU 2nd Cut-off for the admission year 2016 has been announced in the late evening on July 4, with no major dips from the previous cut-off marks witnessed for the most sought after courses, where BA (H) Psychology programme in Lady Shri Ram College has the highest cut-off at 98.25 per cent. The highest cut-off difference in the second list noted is 8 points in BA (H) Punjabi programme, where it was at 95 in the previous list, issued on June 30 midnight. Further, the most sought after programmes with highest cut off percentages for the second round of DU 2016 admissions includes BA (H) English in LSR college, Economics in SRCC, B.Com (H) in Ramjas, B.Sc (H) Computer Sciences in PGDAV college and are available at 97.50, 97.75, 97.50 and 97 percentages, respectively. While Ramjas College of DU North campus in the first cut-off list had put the bar at 99.25 per cent for admission in B.Com (H) programme, aspirants with 97.75 per cent are offered admission in the same programme for the second round of DU 2016 admissions. Those who wish to pursue the honours programme from Shri Ram College of Commerce need to have at least 97.50 per cent, which is 0.50 per cent lower than the DU 1st cut off per cent as announced by the college. Admission for B.Sc (H) Electronics programme at Shri Guru Tegh Bahadur (SGTB) Khalsa is available at 97.66 per cent, while in the first list was available for aspirants who have scored as high as 99 per cent calculated at par ‘Best of Four’ formula. As per the DU 2nd cut-off list, programmes like B.Com is available in Ramjas college at 97.25 per cent while in the previous list was marked at 98.75 per cent. Further, an aspirant needs as much as 97.50 per cent for getting a BA (H) Economics seat in Ramjas college, which in the first list was available at 98.50 per cent. Moreover, the programme is also available in Kalindi College at 94 per cent, Hansraj at 97.50 per cent and LSR college at 97.50 per cent. The cut-off per cent in the second list in these colleges for the honours programme show a difference of 4.50, and 0.50 per cent, respectively. However, no change in per cent are witnessed even as the second cutoff is announced for the programme in Hindu at 97.75 per cent. Some other colleges, which are offering admissions in some of the courses at the first list cutoffs include, Gargi College for Philosophy programme at 86 per cent and Ramjas (BA programme) at 94 per cent. PGDAV College has retained its cutoff for as many as six courses- Economics, History, Political Science, Mathematics, BA programme and B.Com (H) at 96.50, 88, 90, 95, 85 and 96.50 percentages, respectively. The DU 2016 admission procedure for second round will begin from July 5, 2016 in online mode only, following which an applicant has to receive admission approval by the college after the verification of documents between July 5 and July 8, 2016. The online admission process introduced this year enables an aspirant to get admission in his preferred programme and college, without even stepping out of his home. Aspirants, however, need to visit their respective college for verification of the various documents including academic, caste and disability certificates. Apart from the document verification process, each step of the DU admission 2016 is in online mode beginning from choice of college and programme till the payment of admission fee.